Svitlana here. 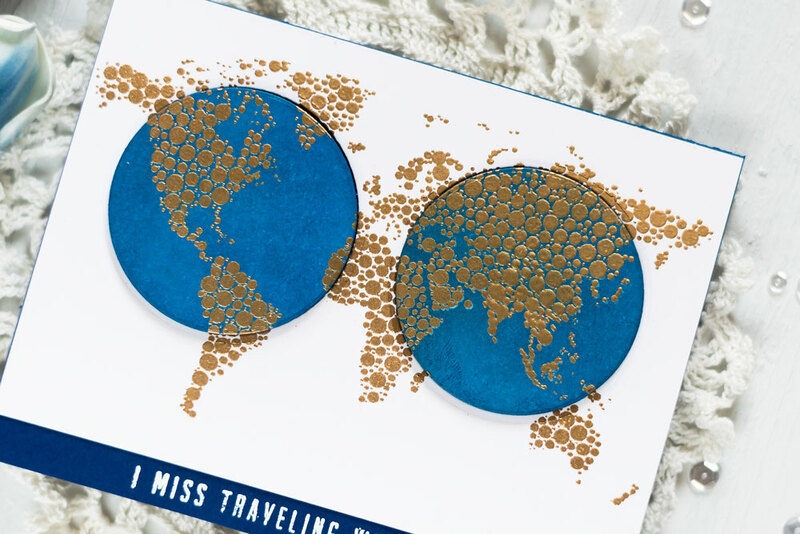 Today, I will be sharing three card ideas with the recently released World Map Stamp Set. 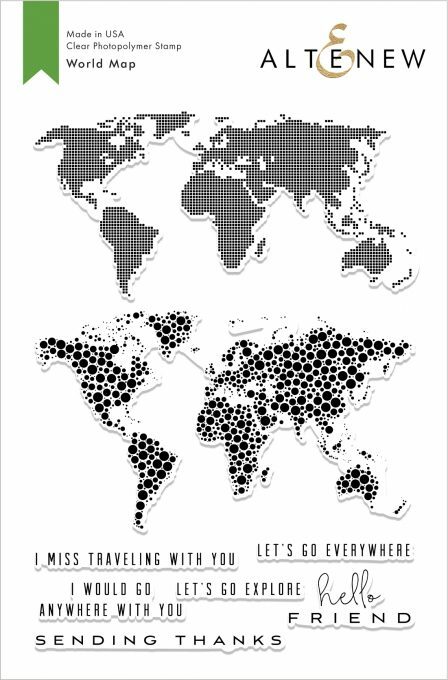 I am personally a big fan of geographic images. 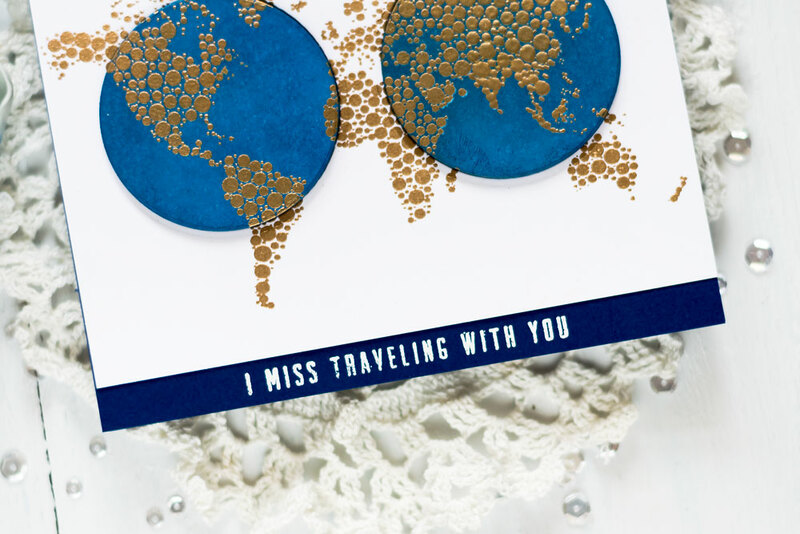 They’re pretty versatile – they can be used in cards, scrapbook layouts, traveler notebooks, PL – you name it! 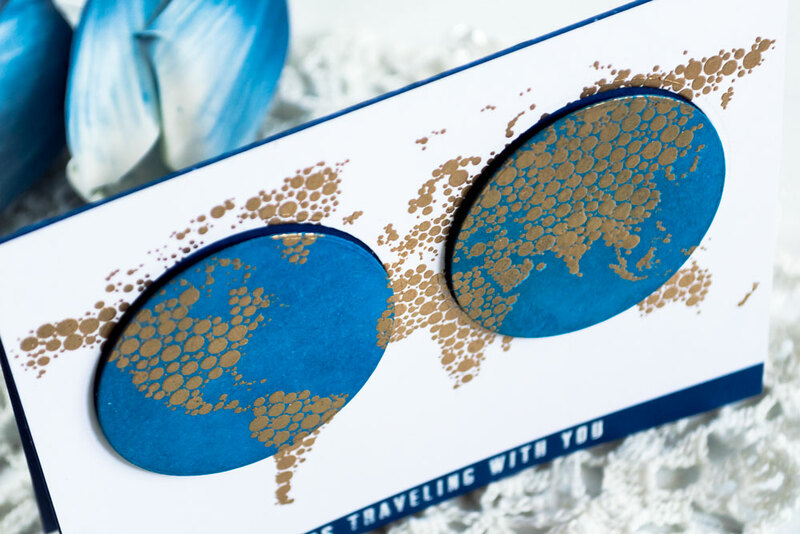 This particular set is also very easy to use as you’re basically working with one stamp. 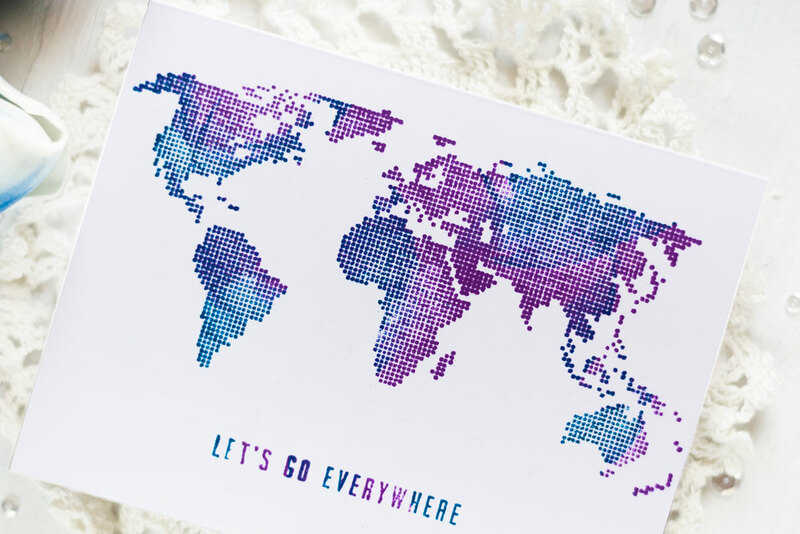 I think one of the first ideas that come to a card maker’s mind nowadays when one sees a world map is to make it multi-colored. And I’m sure you already saw many wonderful approaches to this idea during the release blog hop. Well, of course, I could not resist going multi-colored too. I made the map two-colored, trying to replicate “galaxy” in a way. This card was so extremely easy to make. 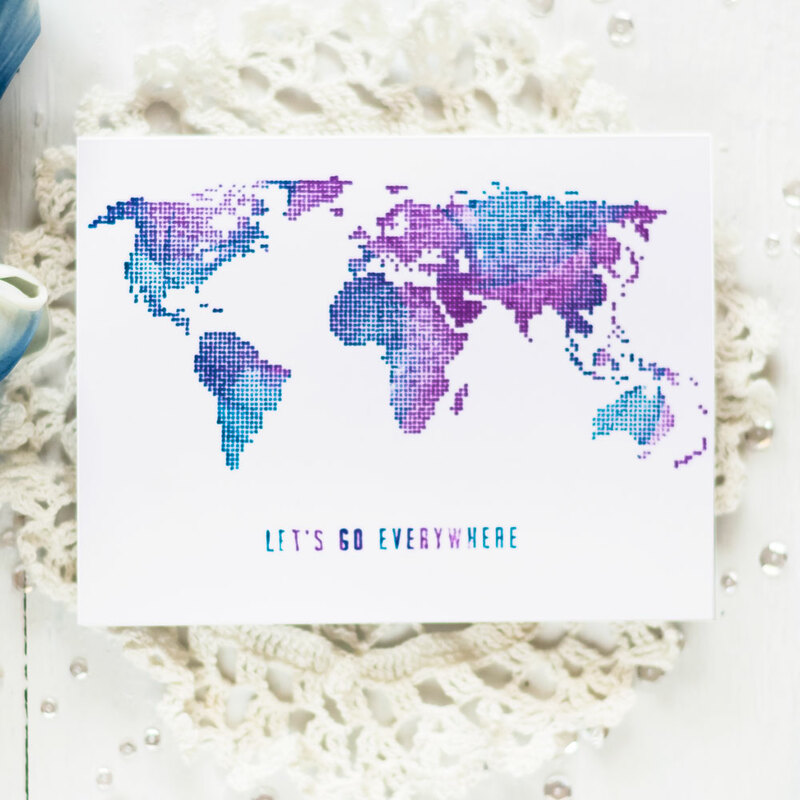 I stamped the map using Starlight and Midnight Violet Crisp Dye Inks onto a white card base. 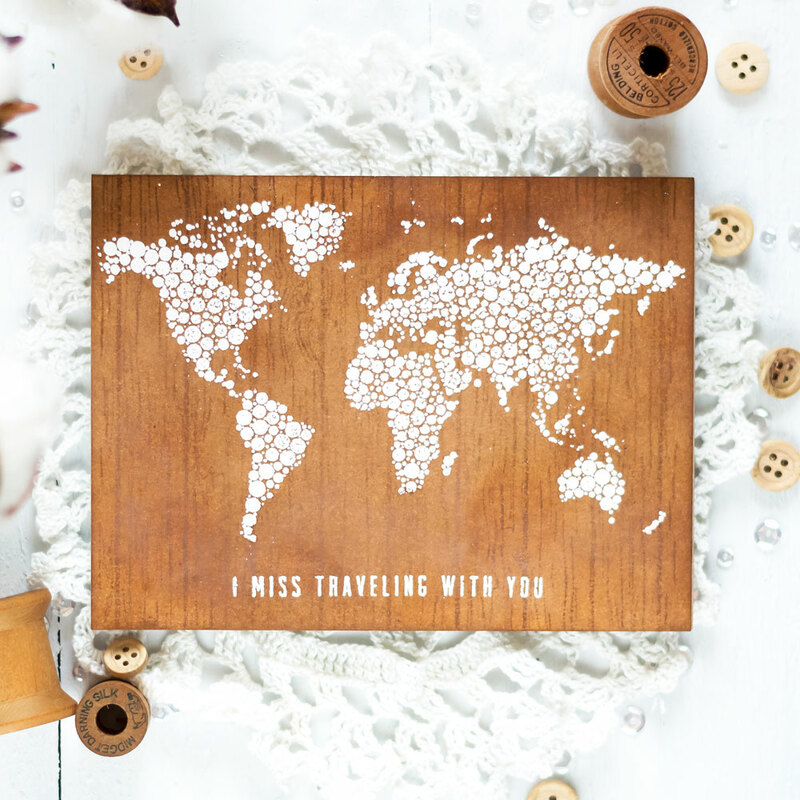 Of course, I was using my mini MISTI for stamping. With such an intricate image and multi-stamping technique, it was a must. First, I inked some parts of the map with the Starlight Dye Ink. And then I added the Midnight Violet Dye Ink to the missing areas to fill up the whole stamp. 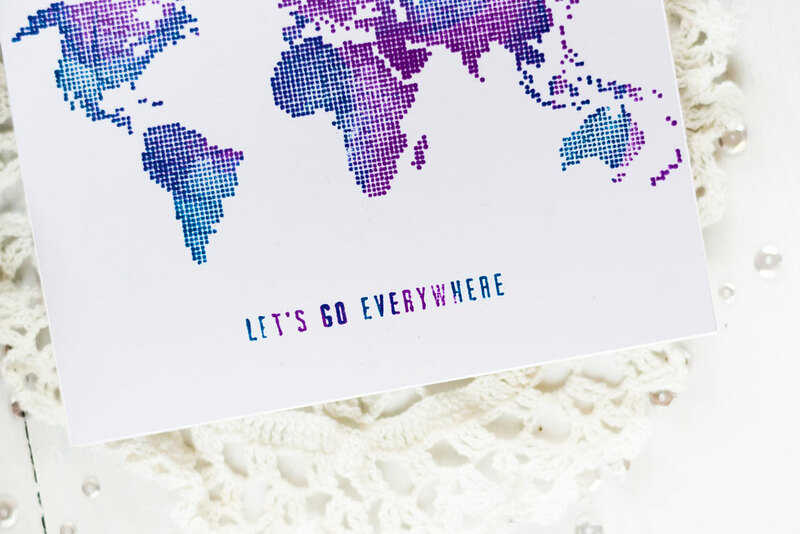 After stamping the map, I stamped the sentiment using the same two inks. Of course, I had to gold emboss the map as well. I just had to. 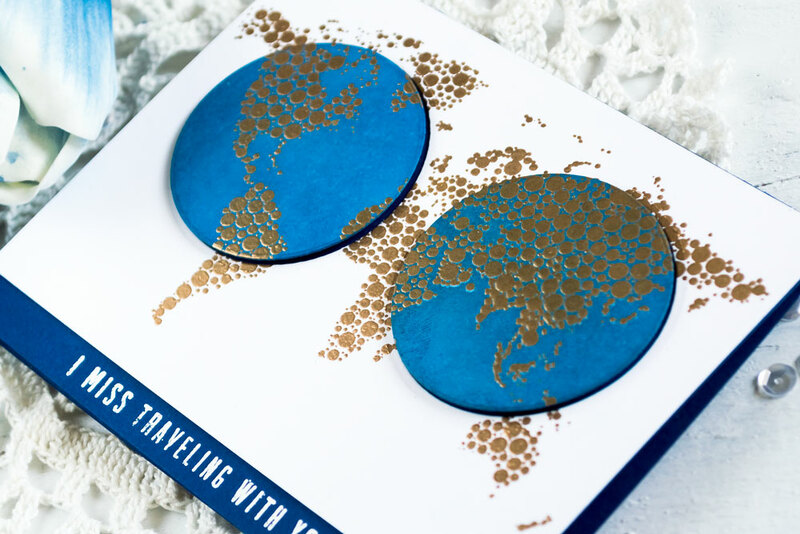 When I was thinking of the background to gold emboss onto, I was deciding between black, blue, gray, and white when this idea came to my mind – to make some kind of hemispheres. 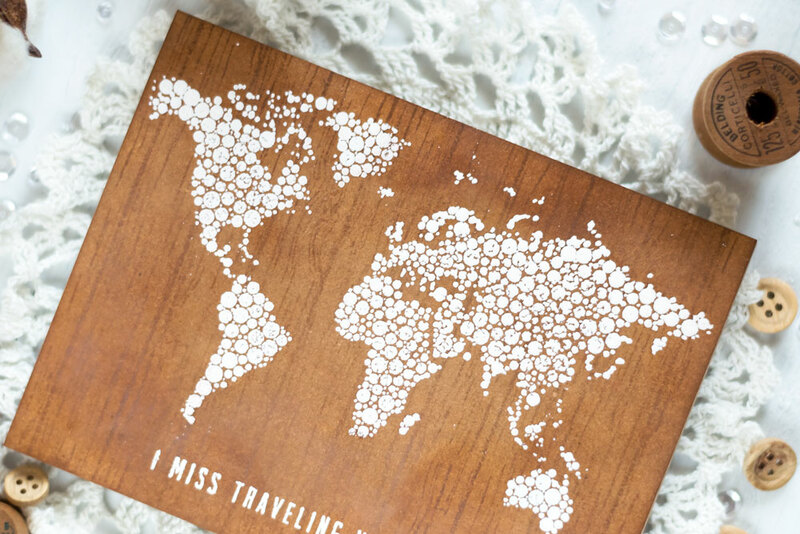 First, I gold embossed the map onto a white panel. Next, I die-cut two circles out of the panel using a circle die from the Halftone Circles Nesting Die Set. After that, I blended the Starlight Crisp Dye Ink onto the circles. I made a panel out of a dark blue cardstock and white embossed a sentiment in the bottom part of it. Then I trimmed the panel, so it’s about a half of an inch smaller than the card base and adhered the panel onto the card base. Lastly, I foam mounted the circles into their negative spaces using black foam adhesive squares. 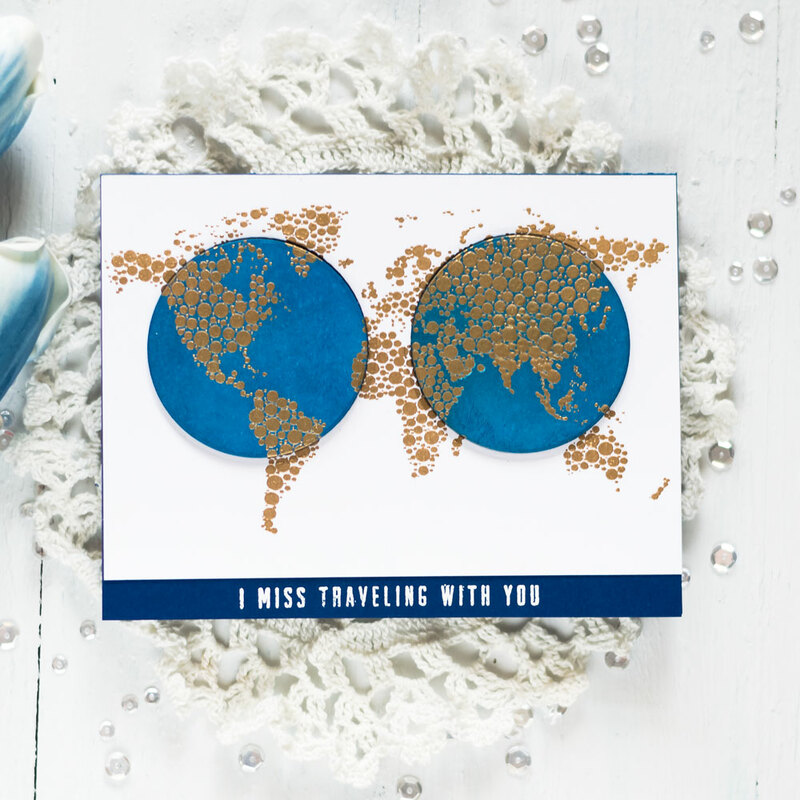 In the last card, I made another design which I had to make using this set – white on a woodgrain. First, I made a woodgrain background by stamping the Wood Pallet Background onto a Parchment panel using the Milk Chocolate Crisp Dye Ink. And then I blended the same ink onto it. 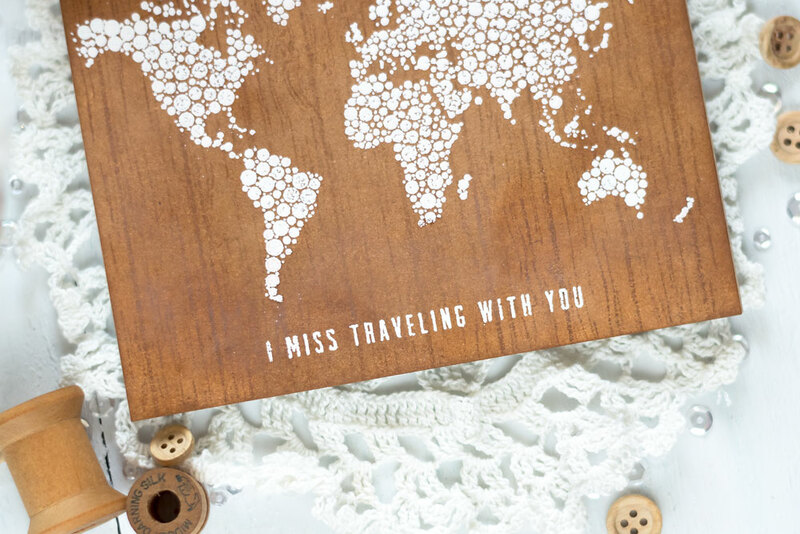 I white embossed the map onto the panel as well as white embossed the sentiment underneath. Lastly, I adhered the panel onto a Parchment card base. 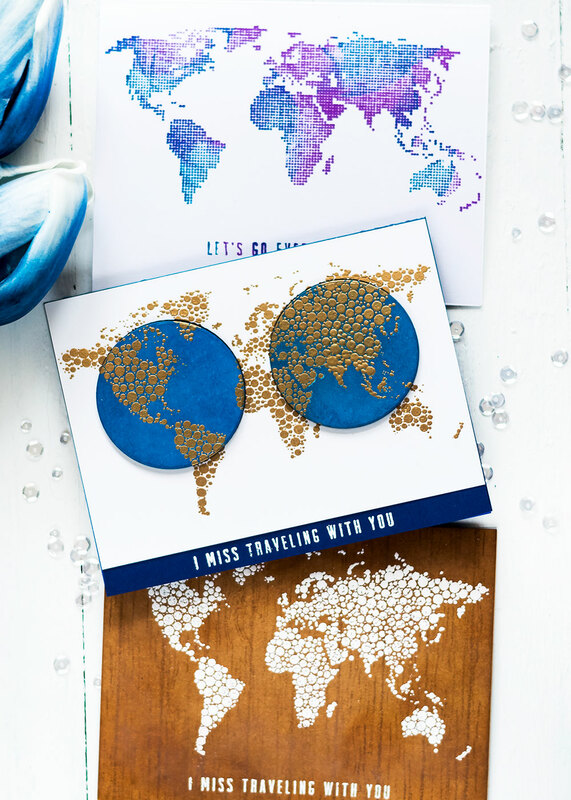 So here you have three ideas of how this stamp set can be used. I hope you like them and maybe give them a try. Below you can find the video where I show how these three cards were made.